1. Class presentation. The material to be learned is initially presented to the whole class by the teacher. Therefore, he needs to prepare a topic or a lesson material. Since the teacher presents the material, the students can focus on the presented material, while on the other side they are concerning to the way she uses of the acceptable pronunciation, correct grammatical patterns, and vocabulary mastery. 3. Quiz. The students are evaluated via individually quiz. The quiz is based on the material given and that have discussed more in team. The quiz assesses individual achievement on the material presented in the class and practiced in team. The quiz is in forms of asking and answering questions by pointing or in order. Here, again the students can learn how to perform a good speaking accuracy. 4. Individual improvement scores. The teacher puts the scores on improvement from pre to post questions scores. Individual scores contribute to a group score, the points contributed to the group are based on a students’ improvement over previous quiz performance. 5. Team recognition. Lastly, as the learning goes impressed, the teacher gives rewards or appreciation for teams who perform exceptionally well or who are most improved. 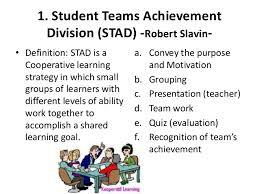 Belum ada tanggapan untuk "Students Team Achievement Division (STAD) method in Speaking"